Me time is rare. We all know that. It doesn't matter if you're a working parent or you stay home with the kids. Heck, you don't even have to have kids! The point is, getting any amount of time to do whatever you want is not always easy to come by. Now as to why I'm in trouble...well that's not important. What's important is that I'm in a time out. 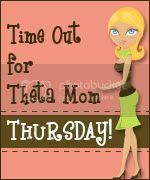 I know this cuz Theta Mom said so! As an adult I will gladly welcome a time out. Kids don't realize how great those opportunities are! Someone tells me to go to my room or that I have to take a nap, I'm all over that!!! So anywho, the point of Time Out Thursday is to take a whole entire hour to myself and then blog about what I did. It would be awesome if I cold say that I took a nap, but by the time I'd be able to take one of those, the kids are in bed. By then, I might as well sleep the whole night. I have to do that every night anyway, so it's not like it's anything special. So I figure I'll take this time out and show off my hobby. I just have to be sneaky about it. GG is awake and she can't see this project. It's for her. I taught myself to crochet and this is what I do after the midgets go to bed. Lately it's been every night because I don't have much time before Christmas to finish the things I'm making. 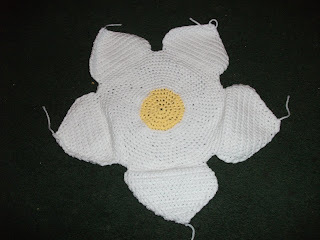 That yellow and white thing...well, it's going to be a flower. And by the way, that's my 3rd attempt at the stupid thing! I got the front done, but I kept skipping steps in the pattern when trying to make the backside. That's what I get when I try to do it off the top of my head while watching a really good hockey game! Then all I have to do is stuff it and sew it together. I'm going to try and make butterflies for it, too. I can't find a decent free pattern so I'll have to wing it. HA! No pun intended. I swear! I'm sure next Thursday I'll screw up and get in trouble again I can post pictures of the finished project. So, if you had an entire hour to yourself, what would you do? Head on over to Theta Mom's blog and see what some other lovely folks did with their time out. That is going to be darling! I can't really think of any me time this week. By the time the boys go to bed, I'm exhaused and since Hubs was out of town, I haven't had time to myself other than that. Cute! I wish I had a hobby like that. I think your flower looks amazing.. Keep going. I can't wait to see more..
That is so cute. Make sure you post again when you get it finished. Post the finished product when U are done, K? 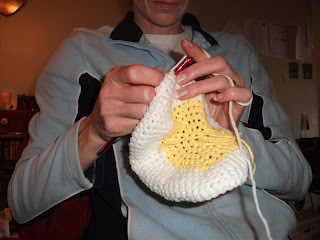 my mom and grandmother tried teaching me to crotchet. I still wish I had the ability but it is hard with 8 thumbs and only 2 of them oposible. I think your time was well spent. I've always wanted to learn how to crochet! Can't wait to see what the finished product looks like! That's a great hobby! It looks so cute. My grandmother taught me to crochet. I have done it in ages but loved the challenge when I was younger. Stopping by from SITS. I like your blog. I'm now following and looking forward to reading more. P.S. Your background is awesome! 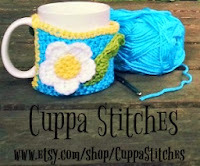 I always wanted to learn to crochet.... Maybe next Thurs? I use all my 'me' time for writing... but I'm not sure I think of it as time off, any more!! If I had a free hour, I would definitely sit my posterior on my couch/bed/floor and watch an hour of worthless TV. I'm a simple person, but I need my television.